The best kind of ride-on toys products for children are those that amalgamate functionality and fun. This great retro-looking kids electric scooter is available in multiple colors and reminds me of my own younger days spent riding an Italian Vespa scooter into the sunset. Any adult has to admit that this well built kids electric scooter looks cool. In fact it looks just like a mini-replica of the real thing and that ain't bad. Kids love toys that look real. I guess that, in the end this is a real electric scooter so it's not even a toy at all. The pocket mod is just a child-friendly version that only travels at speeds of 15 miles per hour. Designed for ages 13 and up I'm sure that mch younger kids ride them around, but Razor have to state a recommended age. Just be sure that your kids wear safety gear in case of a fall. There are various models that are different mainly in color. I list them all below, the models are called the Betty, Sweeet Pea and Vapor with the colors in Pale Pink, Purple/Pink and Black. A cool mini Vespa, who could ask for more mod? Being a parent, one cannot begin to describe the various benefits of having your child find maximum enjoyment with something that serves the dual purpose of learning and play time which is recognised as beneficial to children in the education profession. 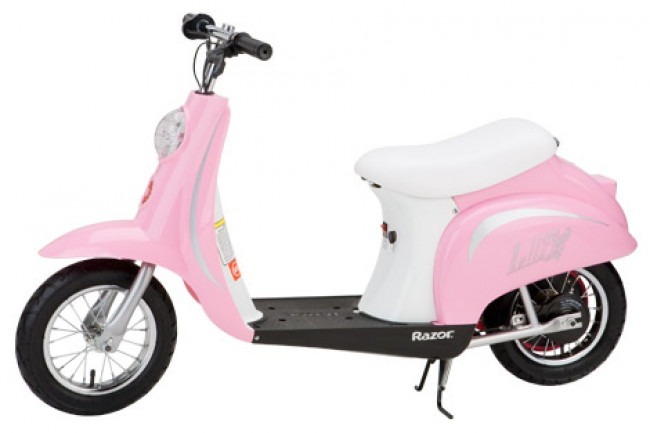 In this review we look at some of the features of a popular and best-selling kids electric ride-on: The Razor Pocket Mod Miniature Euro Electric Scooter. 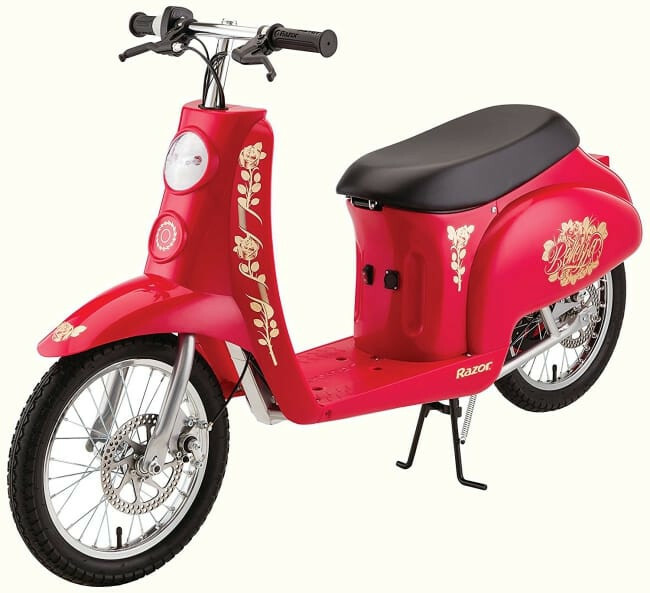 The following is a list of some of the most important features that the manufacturer has brought to the fore when it comes to this electric scooter. One of the multiple colors available is this salmon pink. Not only do these features ensure that play time is enhanced in terms of all out fun but they also assist in building the child’s sense of co-ordination and balance. To ease the fears of those parents who might be apprehensive to allow their daughters to use the electric scooter out on the streets, the makers have introduced a powerful motor in each of their products. All of the above features are included to ensure that your daughter has a perfectly safe ride. Moreover, the battery operated nature of the vehicle makes it easy for anyone to store it within their house without any hassle of leaks or less than stellar hygiene. Being a parent means that you are bound to suffer from some anxieties when their little one goes speeding down the hill in a toy motor bike. The Razor Pocket Mod Electric Scooter is one such product that place safety above everything else. From the wider tires to the safe handlebars and limited speed level – only up to 15 mph- this product is definitely safe for kids to use. In fact, though the product description states that it is for years 12 and above, a lot of parents allow their 8 year olds to ride it as well. While the key is to keep an eye out for your little daughter, the overall safety is definitely top quality. Scooters are meant to be comfortable. In order to ensure that the kids have a wonderful experience that is both comfortable and safe, the makers have made sure to include wide, padded seats. Not only does this ensure that the child will have a stellar experience, but it also ensures that they do not suffer from back injuries and other posture problems. Since the target audience of these products are young girls around the age of 13 it really fits the bill. Back in the day girls would love to ride their Vespa scooters like a true mod or modette and now your daughter can do the same and pay homage to the 1960's. Get out your old record collection and play The Who or some of those old Motown hits and you will be swinging your way to happiness in no time! These scooters are designed in a trendy and sleek manner that is both fun and fashionable at the same time. Retro Italian style and a great modern twist all in one! One of the greatest aspects of this Electric Scooter is the fact that it is easy to use and construct. Unlike many brands that have a complicated guide informing the parents how to go about construction, the Razor Pocket Mod product has a comprehensible "How to Construct the Scooter’ guide included. From the motor to the handlebars, every part mentioned is to be found inside the box and the construction quality is superb. 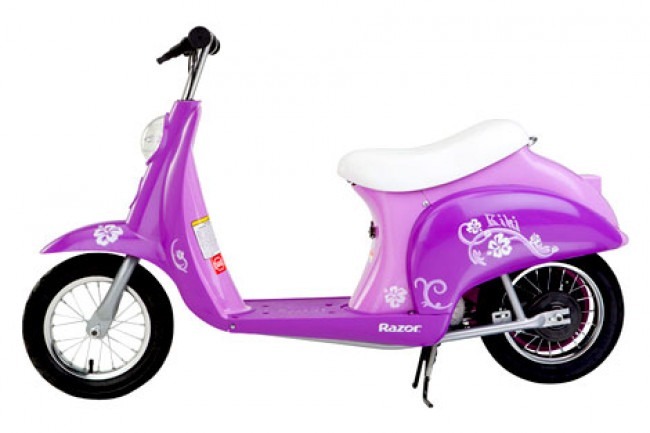 Both light and safe, this is a true joy ride for kids. This model, (pictured below) has all the cute trimming, decals and styling that a younger girl would love. 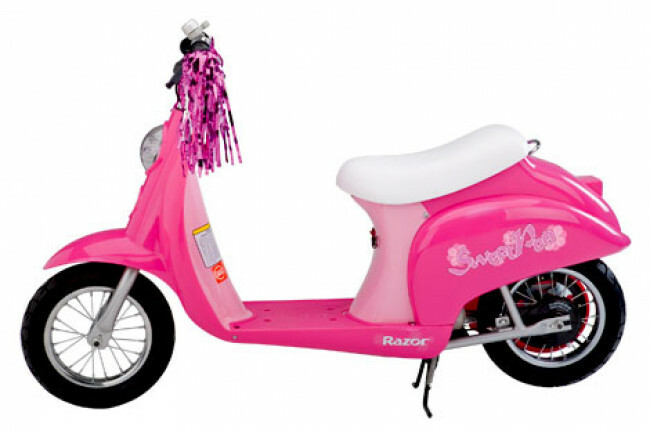 Very pink and girly for those Barbie style ride that she always dreamed of! the Sweetpea version of the pocket mod is pretty much the same deal as the retro pocket mod scooters but with the additional styling. 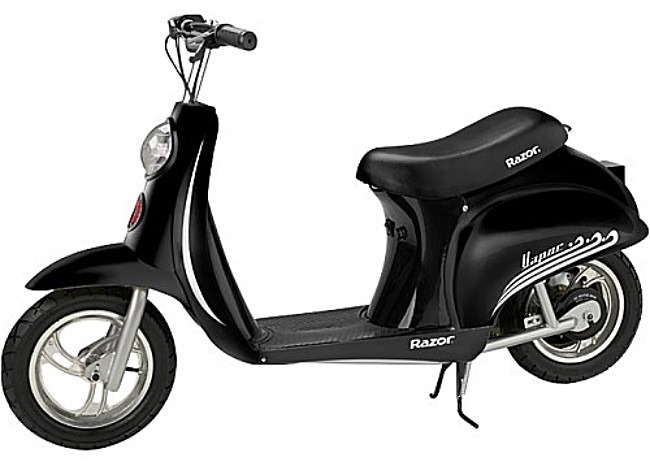 Razor's newest edition to this stable of Euro-styles retro scooters is the Bellezza model which is a totly upgraded version of the pocket mod. 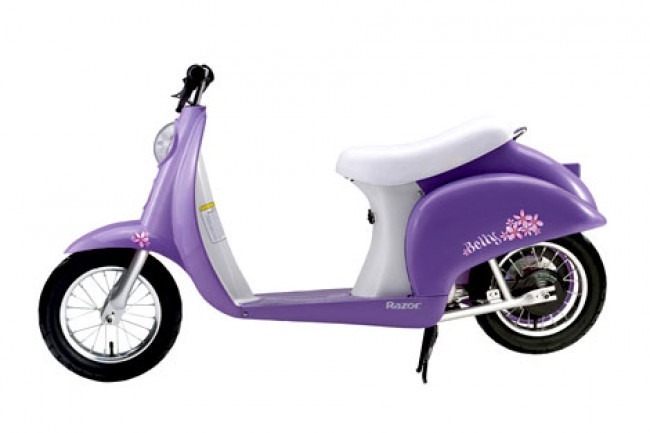 The Bellezza can take a rider weight of up to 220lbs and is recommended for riders of age 14 and up. It is a larger size than the modelsa above and has disc brakes on the front and rear wheels. 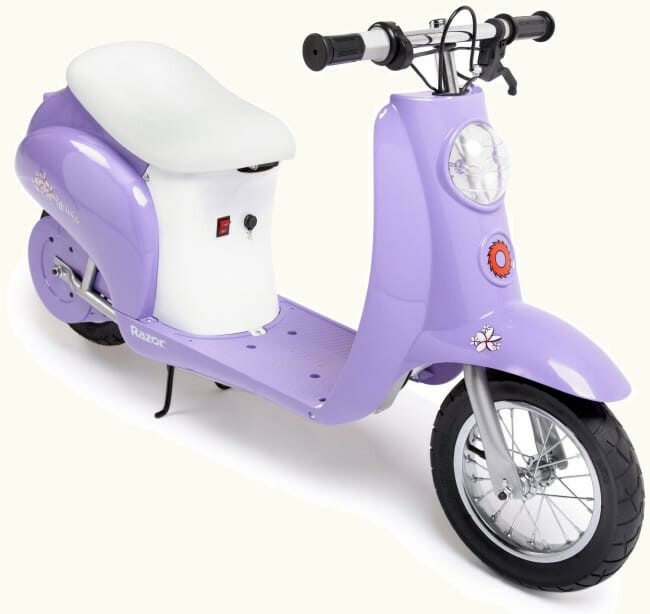 The Bellezza Pocket Mod also features 16" air tires and a 500 watt electric motor. The Bellezza Mod can travel at speeds of up to 16mph. It's nice to see older kids and teens catered for with the Bellezza. It is rare that one finds a product that is so great within a certain budget. The Razor Pocket Mod Miniature Electric Scooter, however, is one such item that is pocket-book friendly, safe for use and fun to ride in. This is arguably one of the best toy investments that you can make for your kids. It's not the kind of toy that any kid gets bored of. From 8 year olds to 12-13 year olds, everyone can utilise the scooter to the fullest and ensure that their summer play time is enhanced in a high quality and Italian style fashion. Whichever model you choose, and there is something for everyone, you will be providing a lot of fun for some time to come. Here is a very cute video of a young lady explaining exactly why you should go out and buy this best-selling kids electric scooter for your duaghter right now! She knows the deal and lets you know in her own inimitable way! This has to be one of the coolest kids ride on scooters. It's a real replica and looks just like a proper vespa! Hey Simon, You doing a great job.This Sounds like an awesome setup – thanks for the write up!